Hi ! Anyone have any news from Uniwheel ? They stopped answering emails and it looks like there is nothing new around... not even on the forum.. They posted a few times at the beginning of the year and there was a new video released of a guy from either France or Belgium who picked one up and then rode it around inside a large hall of some kind. After that. Nothing. They keep dropping off the radar only to then out the blue make some announcement months/years later. I imagine they are still around, they just have no clue how important community engagement is in helping their wheel take off. @vladmarks has a good relationship with them. Maybe he can elaborate. It's a shame. I think the Uniwheel actually is a nice looking wheel for the last mile commuter (with a caveat that it needs a trolley handle). Try phoning them before you spread rumours about them closing down. They're part of a large technology investment fund so it seems unlikely they are 'Out of Business'. I've called them but the guy told me to email... I did 3 times but no answer... It was a different number also, let me try this one. Thanks. He asked a question. Didn't make a statement. I'm not sure why you needed such a harsh response. Why don't you ask your Paris dealer? I did... I've ased e-roue if they can get a spear battery as they are selling uniwheel, they told me they gonna call them but no news too... ? BTW, what was the outcome of your test ride? I am seriously considering to check out the Uniwheel, but if e-roue can't organize a spare battery, I most likely will not buy it. To have at least one extra battery seems to be a must for this wheel. 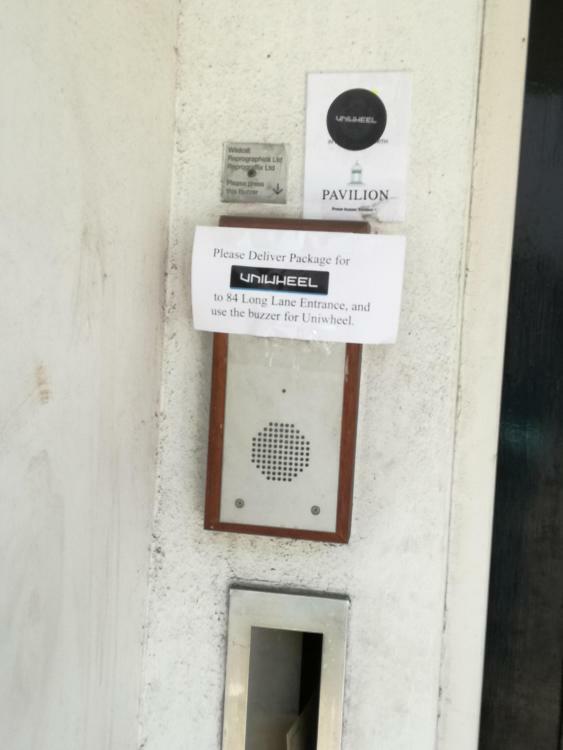 I was walking past the Uniwheel offices just this lunchtime and they still appear to be in the same block although they might of moved units? I have rung the buzzer a few times previously but no-one answered. I've never seen anyone riding a Uniwheel despite working about 200 meters from their office! I wouldn't mind having a chat with the team and see how the wheel handles... I did see someone whizz down Borough High Street on a Kingsong today which was the first wheel I have seen in a while. I never understood what was going on behind the scenes at Uniwheel. It still does not seem to me they ever were really in the business of building an electric unicycle, their entire behavior was too off for that. The Uniwheel felt more like a side effect of something else... whatever that was (is?). Patent stuff? Fleecing gullible investors? Collecting subsidies? I wonder if they just simply ran out of operating money. To fund a project like this outside of China it likely requires a huge investment and backers with deep pockets. By the time a product is ready for release it can already be dated in terms of specifications for the asking price. With so many Chinese wheels on the market being cranked out at a relatively fast pace, I imagine that the available market share dwindles as time goes by. Those banks loans and money owing to staff, suppliers, and contract companies can easily overwhelm a new start-up company. Trying to update an already delayed project to compete against existing products can be costly and a difficult game of catch up. At a certain breaking point the company collapses, and plans get scraped. I'm not saying this is necessarily the case for UniWheel, but as time goes on it just looks more and more like what is happening. If someone can dispute this, please by all means help clear the air. Not only that, but going from a finalized working prototype to actual mass production is a very big challenge. Upstart costs are through the roof. They held a large deposit from me for well over a year before I got fed up and asked for it to be returned. Fair enough, it was returned immediately so I don't think they were trying to fleece anybody. I would have preferred a working wheel though. I think we'd all like to see a company outside of China create a viable, competitive product especially one that has good engineering principles incorporated from the start. I think that's why people were excited about UniWheel way back when, but with high quality and well thought out engineering comes a need for time and development. I loved the look of the UniWheel and the rubber replaceable "bumpers." The LiFe battery I wasn't really sold on, but I think the reasoning behind it was somewhat sound. It's difficult though to compete against high density lithium ion cells when it comes down to it. People want performance and top notch specifications judging by the amount of turn around people have with their rides. It seemed damned unlikely 9 months ago, AFAIK absolutely nothing has changed since then, I can find no updates or newer information at all on line. This has always been my view, by the time I’ve gone 8 miles my 340Wh wheel is becoming unpleasant to ride, I suspect would get at least the same range out of Uniwheel’s battery without the slowing down or worry of damaging the battery. Yes, first solowheel was using also LiFe then they switched to traditional LiPo and then it statarts to be a disaster... ?